A question often asked is, “What are ergonomic risk factors and which ones are worse than the others?” The answer to that question is not as straightforward as it may seem. The truth is that each risk factor has the potential to be the worst injury depending on the circumstances of the situation. For that reason, it is a good idea to proactively assess jobs and job processes for all ergonomic risk factors, and then develop plans of action to mitigate the potential for work-related injury before today’s soreness and discomfort becomes tomorrow’s lost time injury or surgical case. 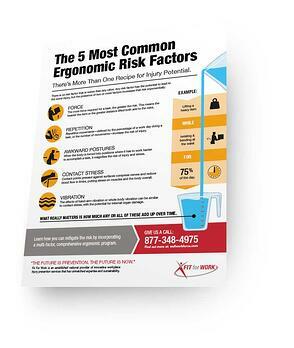 Download our printable infographic to learn more about ergonomic risk factors and how they can affect your organization.